Having been able to do things in front of the cam might have been rewarding for artists but Kristofer Martin, Derrick Monasterio and TOP One Project has been doing the legwork since their respective careers started on GMA's stable. Kristofer, is not a stranger to show business and started at an early age in the other channel. He's been awarded a few but this one from PMPC proved how he's worked hard these couple of months and how he wanted to hone his craft as an actor. He got the nod of the press club for his portrayal in a Magpakailan Man episode done a few months ago. You could feel how enormously eager he is to still learn despite winning this even if he's well rewarded and trusted with shows by GMA. I'm sure he'll have more accolades to his belt with ease and get a lot of attention with the KrisJoy pairing that's being given a title of #ExGoals at times they're seen on screen. I love Kris and Joyce so much, I was a little rude during the question and answer trying to get Kris to answer my questions, for that I have to apologize. But remember I love you two! Congratulations again on the Best Single Performance by an Actor Award! 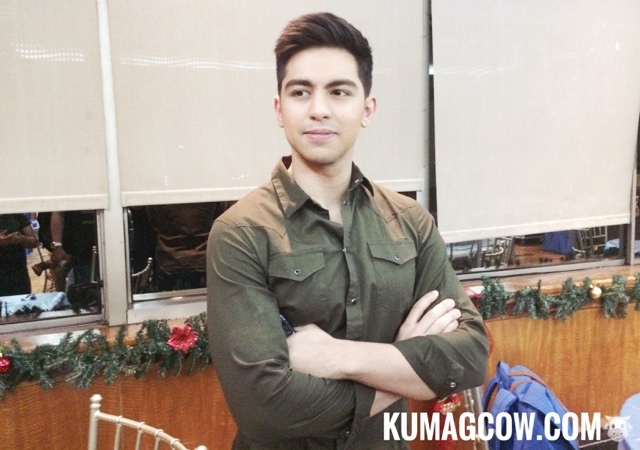 Derrick Monasterio can no longer call himself a newbie as he's now the recipient of the New Male Recording Artist of the Year for 2016, also by PMPC. This good looking boy is an eye candy, has unbelievable charm that would sweep girls off their feet. He's also starring in the show Tsuperhero which you can watch every Sunday pre-primetime on GMA. His outlook on his career probably came true because of how he is VERY driven. I interviewed him about his singing in the past and this was one thing he would want to achieve, how fortunate could he be? He's blessed because I believe he's one of the most humble, very sincere guys who want to succeed in things he wants to do. I personally want him to do just that, and be blessed because he deserves it. TOP One Project comprised of Adrian Pascual, Joshua Jacobe, Louie Pedroso, Mico Cruz and Miko Manguba has already done a successful concert at the Music Museum. Aside from that, they've got a brand new spanking album, a surprise music video and now they're being rewarded for it. They just got the Group of the Year Award from the same award giving body and it didn't come at the most opportune time because they've been supported sternly by the network, GMA Artist Center and the throngs of fans who believe in them. The boy band has already impressed a lot of people with their undeniable talent in singing, their choreography and knack to produce original music. They've also kept humble all these years and they're still improving, they're not done yet even if they already won an award mind you. That just signals there will be MORE things to come to these guys very soon! Here's our interview with the guys over at GMA's blogcon a few weeks ago. Enjoy!